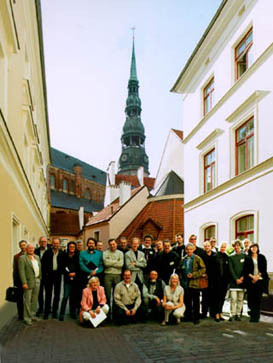 film critics and film theoreticians from 15 European countries took part. One can say that documentary production is booming  a great number of journalistic reportages, researches, educational films etc. is increasing. We are worried about another kind of documentaries we are worried about  call them as you like - creative, conceptual, personal, which are unknown to general audience. It is hardly possible to make such films nowadays, since they have neither commissioners nor audience. Being unpopular, they are doomed to dying out. However, all this does not mean that this kind of documentary cinema is unnecessary. That is why we want to gather both film critics and film makers to watch films brought by them and to share opinions. We are aware that not theoreticians but film authors are those who determine creative process and their ways are unpredictable. Our aim is not to work out any recipe how to make films, but to discover those qualities in the latest films, which are the most promising in a way to survive in TV environment. It is obvious that documentary films are hardly competitive in the market of show business. On the other hand, film authors cannot help reckoning with mass culture, otherwise they would not be able to establish contact with the audience.